Catch up on the latest news from Biohabitats, find out where we’ll be in the coming weeks, and meet the newest members of our team. Earlier this year, we joined 1% for the Planet, pledging to donate 1% of annual sales (through a combination of monetary, in-kind, and approved advertising contributions) to support nonprofit organizations focused on the environment. Joining 1% for the Planet enables us to further address pressing environmental challenges by aiding nonprofits who are also driving solutions. We’re honored to be part of a group of companies that has collectively donated more than $175 million to environmental nonprofits, and we look forward to adding our own contributions. Society for Ecological Restoration (SER): Our sponsorship of SER will support the organization’s internship program and efforts to bring greater diversity to the field of ecological restoration. EcoDistricts: Our sponsorship of EcoDistricts will support many EcoDistricts initiatives, including the EcoDistricts Accelerator program that provides technical assistance and capacity building, such as the upcoming webinar on March 20 – Blue Infrastructure—A Wholistic Approach to Ecology, presented by our own Pete Munoz and Juan Rovalo. Our sponsorship also supports the EcoDistricts Incubator, a three-day intensive designed to empower district-scale teams to accelerate sustainable projects, the annual EcoDistrict Summit, and an update to the Living Infrastructure Guide that we first produced with EcoDistricts in 2015.
International Living Future Institute (ILFI): Our sponsorship with ILFI, the organization behind the Living Building Challenge (LBC), will support a plethora of activities, including technical assistance for the LBC and the Living Community Challenge (LCC), and guidance in the realm of water and ecology for LBC 4.0’s Place and Water Petals. Pete Muñoz and Juan Rovalo will be joined by Bill Browning of Terrapin Bright Green and Tenna Florian of Lake|Flato on May 2 at Living Future 19 for an informative session called Net Positive Ecology: Out Work Outside. Rewilding Institute: Our sponsorship of the Rewilding Institute, an organization focused on advancing continental-scale conservation and restoration in North America and beyond, will support the organization’s publications and podcast series. Stay tuned for upcoming announcements! We believe that business can be a force for good, and we are pleased to share our progress toward the highest standards of accountability, transparency, and social and environmental performance in our first-ever Annual Benefit Report. Northeast Ohio’s Chagrin River, which flows directly into Lake Erie, is so well known for its beauty and ecological value that it has been designated a State Scenic River. In recent decades, however, development and dam removal in the watershed had taken a toll on the river. In a particularly degraded section flowing through a subdivision of the Village of Hunting Valley, banks had eroded to heights of nearly 15 feet, the reach had become unsafe, and water quality and habitat were suffering. With grant funding from the Ohio EPA, and partnerships with the Chagrin River Watershed Partners, Western Land Conservancy, and private landowners, the Village of Hunting Valley initiated an effort to restore the reach. Working with Meadville Land Service, we helped the Village restore 500 linear feet of river and over one acre of adjacent riparian area. Our approach, which emphasized the use of on-site material and alternatives to rock, included the installation of an engineered log complex to stabilize the toe of bank, slow near bank velocities, and direct flow away from the bank; soil lifts and live branch layering to stabilize the slopes and provide roughness, habitat, and shading to the stream; and the restoration of riparian habitat and floodplain connectivity through native plantings and grading. 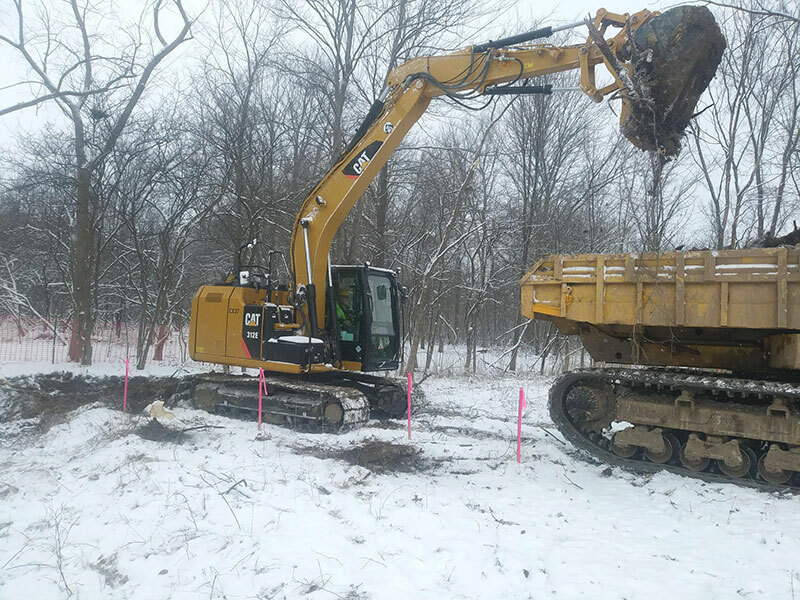 This was northeast Ohio’s first large-scale stream restoration project to use an engineered log complex. We wrapped construction in August 2018, and so far, this technique is looking like a promising alternative to traditional rip-rap and rock stabilization. For more information about this project, contact Kevin Grieser. Wood You Believe How Things Look at Spa Creek? 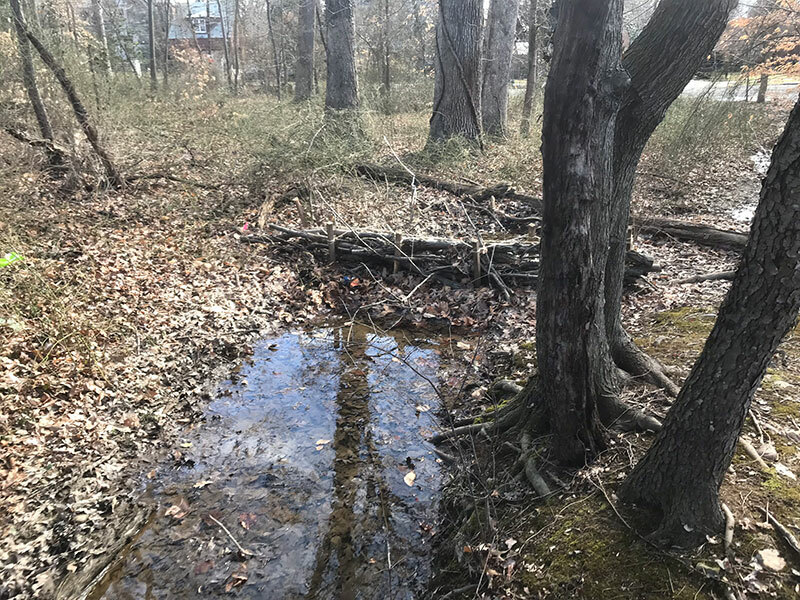 Last month, we saw evidence of regenerative design at work in the headwaters of Spa Creek, a treasured natural and recreational resource in Annapolis, Maryland that provides habitat for many species native to the Chesapeake Bay. It came in the form of three natural beaver dams. In the fall of 2017, we completed construction of the restoration of a 5,000 linear foot section of Spa that had become an eroded sluiceway for stormwater from surrounding development. With funding from Maryland Department of Natural Resources’ Chesapeake and Atlantic Coastal Bay Trust Fund, and leadership from the Spa Creek Conservancy, we created and implemented a design to establish long-term stability, increase nutrient uptake and other water quality improvements, and enhance aquatic, wetland, and riparian habitat. Working with our subcontractor, Meadville Land Service, we removed gabions, created step pools, and raised the channel bed to reconnect the stream to its floodplain. We also added beaver dam analogs, man-made structures that mimic the form and function of natural beaver dams, in a 1000-ft reach of stream immediately upstream of Spa Road. Before the restoration, resident beavers repeatedly engaged in a Promethean struggle: they’d build a dam only to have it wash away in the next storm. Storm after storm, the cycle would repeat. We are thrilled to report that with the new conditions created by the restoration, the natural beaver dams are staying put, along with all of the benefits those dams bring in terms of ecological function and water quality improvement. For more information about this project, contact Joe Berg. The Rock Creek Tennis Center is located less than six miles from the U.S. Capitol in Rock Creek Park, one of the first national parks established in the U.S. 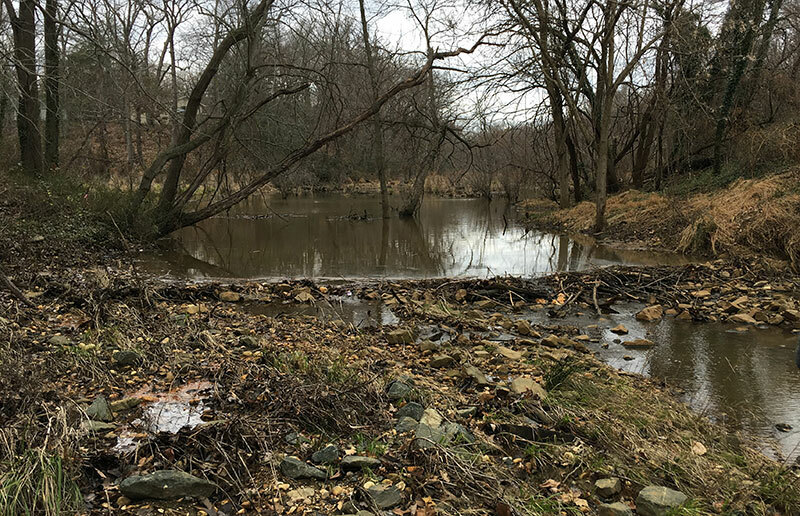 Situated at the headwaters of Blagden Run, a tributary to Rock Creek and ultimately the Potomac River, the 26-acre site was developed before the District enacted its stormwater regulations. Over the last few decades, uncontrolled storm flows from Center’s impervious surfaces has eroded gullies in the surrounding forest, lowered infiltration and groundwater tables, and degraded habitat of native protected species. After the U.S. 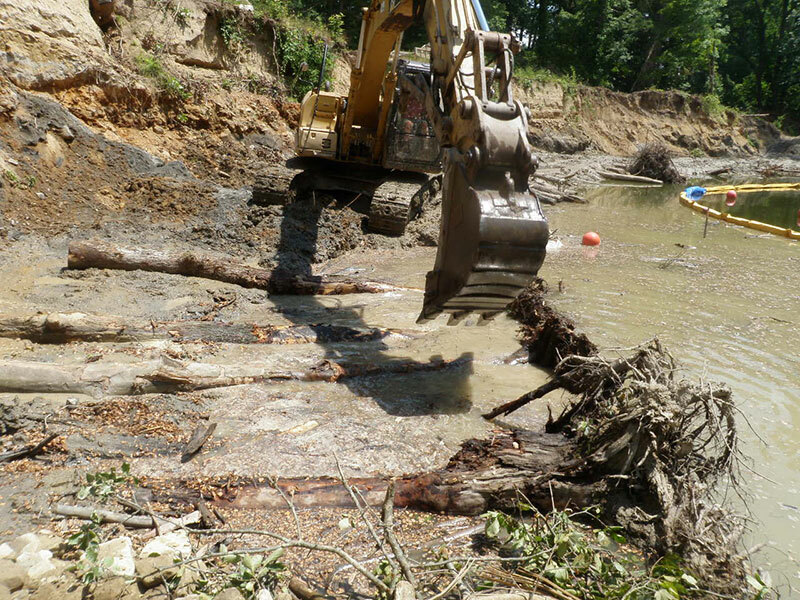 Fish and Wildlife Service and the National Park Service identified the site as a priority restoration area, the District Department of Energy and Environment launched an ecological restoration initiative. Over the last several months, we’ve been working with the District to restore Blagden Run’s natural hydrology, prevent erosion, reduce stormwater pollution, and restore habitat by retrofitting more than 13 acres of impervious surface with green infrastructure. In addition to seven bioretention basins, a pollinator garden, and a level spreader, we have designed and constructed several channel stabilization structures made with locally sourced wood. They include a log sill for grade control and several post and wattle structures and brush sponges (which resemble brush piles) to slow storm flows and prevent gully erosion. While the project is projected to provide 28,500 CF (213,000 gallons) of treatment storage volume, it will also enhance Rock Creek Park’s habitat, connectivity, and beauty. While we look forward to watching the live elements of this green infrastructure become greener in the warmer months, we are pleased to see it already working hard after a recent storm. For more information about this project, contact Bryan Arvai. The Traverse City non-profit Commonplace, known for its two “innovation hubs,” or shared workspaces, is taking cooperative buildings to the next level with a project called Commongrounds. 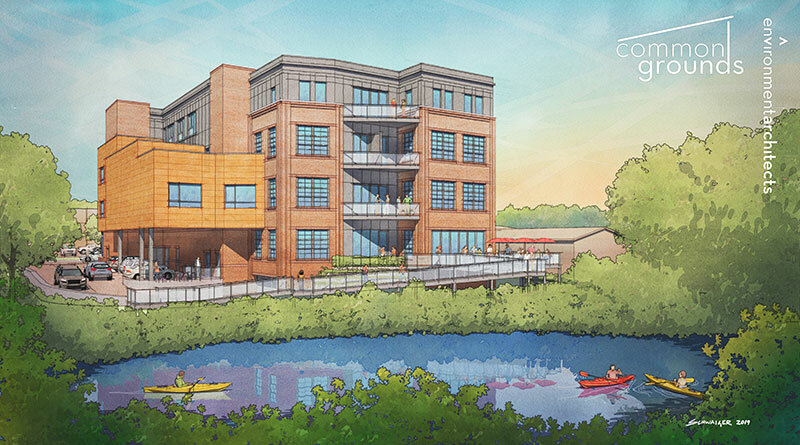 Located on what is currently a vacant lot on the north shore of the Lower Boardman River, the four-story building will house a creative mix of uses, including a riverfront cafe, listening room, child care, coworking and office space, and workforce housing. Its creators also seek to infuse into the site another kind of cooperation: with nature. As part of the project design team with Environment Architects, we are working to create a water balance for the site and optimize all water resources as part of a restorative site approach. One option being evaluated is a rainwater and reuse system for toilet flushing, which if implemented, would reduce the site’s non-potable water demand by 80%. We are integrating these water strategies with multi-benefit green infrastructure (green roofs, permeable paving, bioretention) to ensure stable, healthy site hydrology that infiltrates surplus rainwater into the soil, avoiding surface discharge into the Boardman River, and allowing the re-creation of diverse, healthy habitat along the shoreline. About four hours southeast of Traverse City, in the opposite corner of Michigan, is the site of an inspiring, regenerative planned community known as Veridian at County Farm. The development is being led by THRIVE Collaborative, a visionary, sustainable development and construction firm with a mission to create nature-rich and ecologically restorative housing, along with Avalon Housing, a non-profit dedicated to providing healthy, safe, and inclusive housing communities as a long-term solution to homelessness. In addition to an innovative mixed-income housing approach using no fossil fuels and targeting 100% renewable energy, the neighborhood plans to include a farm store that will sell locally grown produce, meats and dairy year-round, and community spaces where residents can connect with each other, access social services, play, and avoid the isolation felt by many in new settlements. The site is adjacent to a 130-acre county park with a trail system winding through re-naturalized agricultural fields, woodlands, and gardens, and within walking/biking distance of shops, services, schools and churches. As part of a restorative, integrated site development approach that strives to balance water on-site and improve ecology, we are helping to explore the potential for rainwater harvest and re-use combined with infiltration-based living green infrastructure practices to optimize every surface for multiple values and benefits. For information about the Commongrounds and Veridian at County Farm projects, please contact David Yocca. West Creek, which flows through Parma, Ohio, is a tributary to the Cuyahoga River and ultimately, Lake Erie. Earlier this month, we broke ground on the restoration of a portion of West Creek that was straightened and tightly sandwiched between a senior center and a power equipment retailer and had lost ecological value. We’re honored to work with the West Creek Conservancy, a non-profit that works to enhance the ecological value and sustainability of urban land in the Greater Cleveland area, to design and build this project. 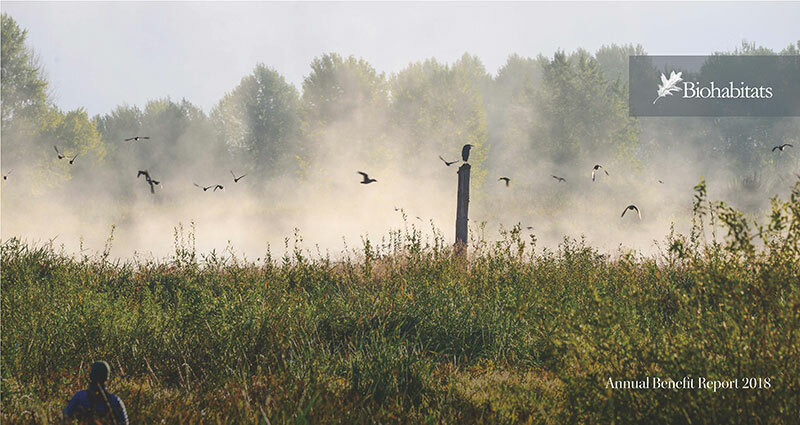 In restoring 500 linear feet of channel, re-establishing floodplain connectivity, and treating invasive species, we expect to see life, beauty, and ecological function return to this portion of West Creek. We promise to keep you posted! For more information about this project, contact Kevin Grieser. There’s Beauty and Opportunity in Them Thar Hills! During some of the most the frigid weeks of winter, several team members from the Chesapeake/Delaware Bays Bioregion offices found themselves in the stream corridors of Virginia’s third most populous county, assessing conditions and looking for opportunities to restore degraded streams and wetlands and retrofit outdated stormwater infrastructure. 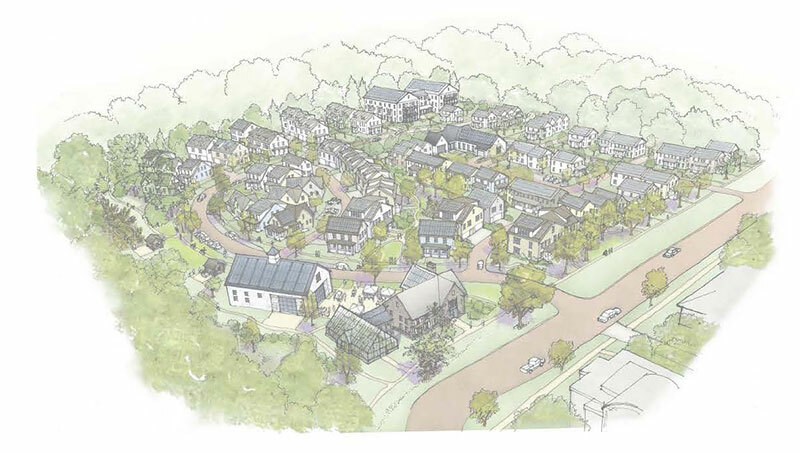 As a subconsultant to Tetra Tech, we are honored to help Loudoun County, Virginia craft its first watershed master plan for the Western Hills area. Groundwater quality is critical in this plan, as most residents in the 70-square-mile study area get their household water from wells. With data collection complete, we are now collaborating with our project partners to characterize watershed conditions and prioritize potential measures to protect or improve the quality of surface and groundwater. For more information about this project, contact Jennifer Missett. What is “blue infrastructure?” Find out on March 20, when Biohabitats Senior Engineer and Practice Lead Pete Muñoz and Biohabitats Senior Ecologist and Integrated Design Specialist Juan Rovalo share ways of handling water that link built and natural environments, integrate ecological science and traditional planning and design, and reconnect people to the places in which they live and work. Don’t miss “Blue Infrastructure—A Holistic Approach to Ecology,” a webinar presented by EcoDistricts. From March 20-22, influential climate, energy, and sustainability professionals from around the globe will gather in Baltimore for the Climate Leadership Conference. 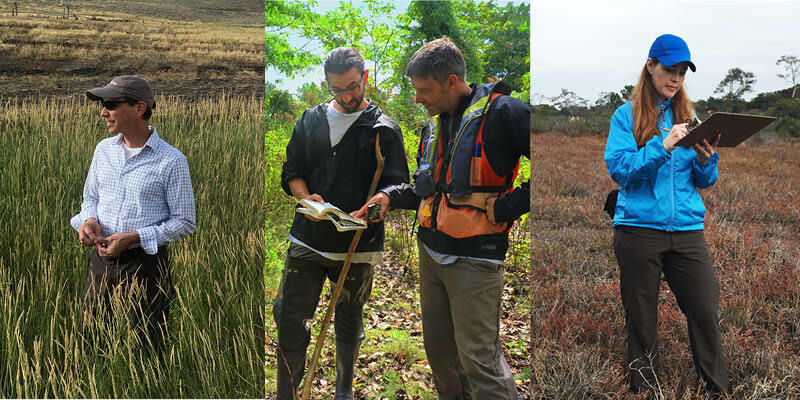 One such influential professional is Biohabitats Senior Ecologist, Joe Berg. Joe will join other expert panelists in a discussion of how to leverage existing funding streams and develop new innovative approaches to finance climate resilience strategies. Kevin Nunnery will be in Raleigh, NC March 21-22 for the annual gathering of the Water Resources Research Institute. This year’s conference will focus on water quality issues. On March 25, Jessica Norris to Gathering for the Greener Good: Park Pride Annual Parks and GreenSpace Conference. Organized by Park Pride, the conference will focus on Parks at the Heart of the Community. Senior Ecologist and Integrated Design Specialist Juan Rovalo will be in Seattle, Washington, on March 27 to attend “Ecological Restoration Symposium: Restoration Beyond the Reference System,” an event sponsored by the Northwest Chapter of the Society for Ecological Restoration and the University of Washington. David Yocca will be in Toronto April 4-5 for the Grey to Green, an annual regional sustainability conference with a focus on green infrastructure implementation at an urban and regional level hosted by Green Roofs for Healthy Cities and the Green Infrastructure Foundation. The Annual Meeting of the Midwest-Great Lakes Chapter of the Society for Ecological Restoration will take place April 12-14 in Pella, Iowa. If you plan to attend, don’t miss “It’s the Wood that Makes It Good,” a talk by Biohabitats Landscape Ecologist, Kevin Grieser. Kevin will tell you what it’s like to install more than 300 feet of engineered log complexes to stabilize vertical banks as high as 15 feet. On April 25, Restoration Ecologist and Construction manager Matt Koozer will present “Restoration Construction: Bridging Muddy Waters-Lessons Learned from the Pacific Northwest” as part of a session on Stage 0 Restoration, Design, and Implementation at the 13th Annual Salmonid Restoration Conference, which will take place in Santa Rosa, California April 24-26. On April 23, Senior Engineer and Practice Lead Pete Muñoz will present “Resilient Water Infrastructure: Change at the District Scale” at the National Adaptation Forum in Madison, Wisconsin. From there, Pete will head to Pittsburgh, where he will help lead the EcoDistricts Incubator April 25-27. Biohabitats is proud to sponsor this year’s Ohio Stormwater Conference, which will take place May 5-8 in Sharonville, Ohio. Environmental Engineer Suzanne Hoehne will present “Nature’s Solution for Streambank Stabilization: Engineered Log Complexes” and “Restoring Ecological Function to Headwater Streams.” If you plan to attend, don’t miss Suzanne’s talks, andbe sure to stop by the Biohabitats table and chat with Suzanne and Water Resources Engineer Carmen Franks! From May 5-10, Jennifer Missett, Joe Berg, and Rebecca Winer-Skonovd will be in Shepherdstown, West Virginia attending the Chesapeake Stormwater Network’s Baywide Stormwater Retreat. Ted Brown will head to Pittsburgh May 19-23 for the ASCE EWRI World Environmental + Water Resources Conference. Ted and colleagues from Blue Water Baltimore will give an inspiring talk about a multi-faceted green stormwater infrastructure retrofit and landscape conversion project at a public charter school in West Baltimore. Water Resources Engineer Carmen Franks and Senior Water Strategist and Engineer, Justin Lyon will also be attending this exciting event. The Society of Wetland Scientists will hold its Annual Meeting May 28-31 in Baltimore, Maryland. If you plan to attend, keep an eye out for Senior Ecologist and Practice Lead Joe Berg, Senior Environmental Scientist, Sarah Roberts, and Senior Ecological Engineer and Practice Lead Chris Streb. Biohabitats president Keith Bowers will be in Greenville, South Carolina June 2-4 attending the ASLA Southeast Regional Conference. 2019 marks the 50th anniversary of Ian McHarg’s magnum opus, Design with Nature. To celebrate Penn Design’s Ian L. McHarg Center for Urbanism and Ecology will presenting Design with Nature Now, an international symposium to be held June 21-22 in Philadelphia. Biohabitats is honored to sponsor the Symposium, which features an inspiring lineup of visionaries. The Symposium will be immediately preceded by the Hotspot Cities Symposium, a two-day symposium at the University of Pennsylvania in Philadelphia, USA co-hosted by Perry World House in association with the McHarg Center for Urbanism and Ecology and the Penn Institute for Urban Research. Senior Engineers Erin English and Pete Muñoz have been promoted to Practice Lead, Senior Fluvial Geomorphologist Ellen McClure has been promoted to Cascadia Bioregion Team Leader. Water Resources Engineer Carmen Franks is now a licensed Professional Engineer in Ohio; Project Designer Shayla Woodhouse has become a certified Engineer Intern in New Mexico; and Senior Ecologist and Integrated Design Specialist Juan Rovalo is now certified as a Professional Wetland Scientist. Biohabitats offers unlimited opportunities for professional and personal growth, amazing benefits including unlimited leave, and a commitment to give back to the communities in which we live and work. If this sounds like the kind of work environment you seek, check out our current openings.